5 Bedroom Semi Detached House For Sale in Rotherham for Guide Price £240,000. 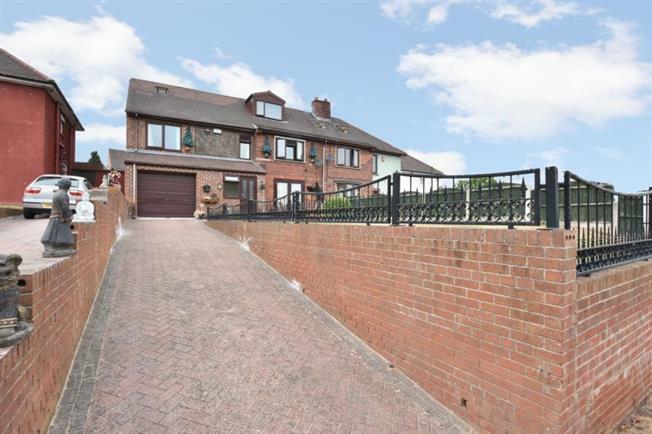 Family home with a stunning view with this extended three storey home. Situated in this sought after location viewing is a must to avoid disapointment. Having been extended by the present owner to provide a deceptively spacious, three storey five bedroomed semi detached home. Elevated from pavement level the property offers far reaching views to the front. The home offers versatile living and must be viewed to appreciate whats is on offer. In brief the property comprises of front entrance porch giving access to the entrance hall, dining room and larger than average lounge with French style doors to rear garden, dining kitchen with a arange of wall and base units, inner lobby with wc and access to garage. First floor landing three bedrooms, master with en suite and family bathroom, stairs to second floor landing with two further bedrooms. Outside block paved drive to front with lawned garden, integral garage. Rear garden with block paving and brick built store. Viewing a must.